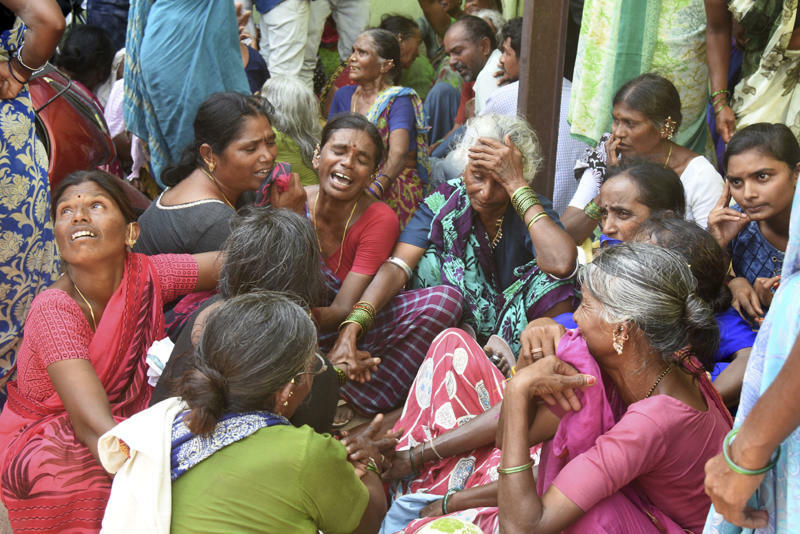 HYDERABAD, India (AP) — A bus carrying pilgrims from a Hindu temple in the hills of south India plunged off a road Tuesday, killing at least 55 people including four children, officials said. At least 33 others were injured. The driver lost control as he hit a speed bump on a road leading from the popular Anjaneya Swamy temple in Telangana state, about 190 kilometers (118 miles) from Hyderabad, the state capital, Transport Minister P. Maneder Reddy said. The overcrowded bus pitched into a gorge. Crowds often throng the temple on Tuesdays. The temple is dedicated to the Hindu god Hanuman, and Tuesdays are seen as auspicious for offering prayers to him. Passersby rushed to help after the bus crashed, mangling the front of the vehicle. Volunteers crawled into the bus through broken windows, carrying the dead and injured though thick grass and up the hill to the road. The injured were taken to area hospitals. Local broadcaster ETV showed chaotic scenes at a hospital in Jagtiyal, where people wailed over bodies in a mortuary. Reddy said at a news conference that the bus depot manager had been suspended. 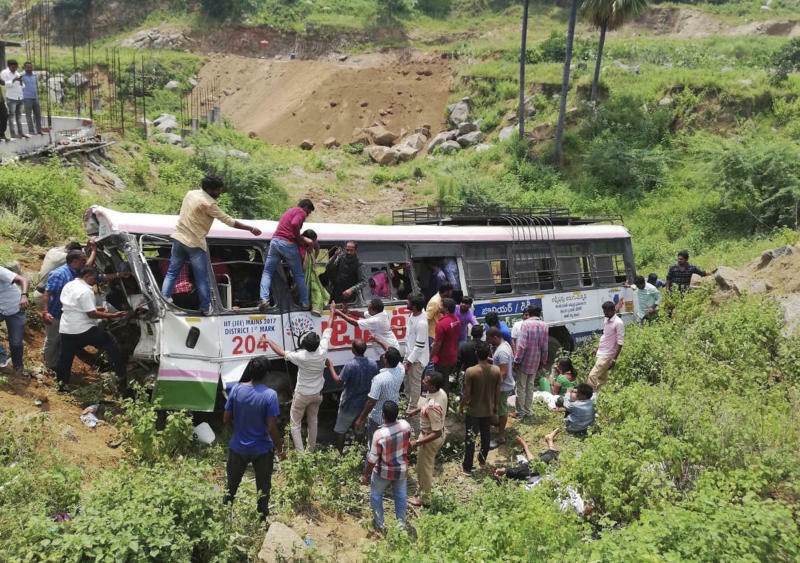 "The bus was carrying more passengers than allowed," Reddy said, adding that the accident appeared to have been caused by a brake failure. An investigation has been ordered into the cause, officials said. Among those killed was the bus driver, who lost both of his legs in the accident and later died in the hospital. "The bus accident in Telangana's Jagtial district is shocking beyond words," Prime Minister Narendra Modi said in a tweet. "Anguished by the loss of lives. My thoughts and solidarity with the bereaved families. I pray that the injured recover quickly." President Ram Nath Kovind also said that he was shocked to learn about the accident. Around 150,000 people die every year on India's roads, often because of reckless driving, badly maintained roads and vehicles overcrowded with passengers. Deadly bus accidents are common. 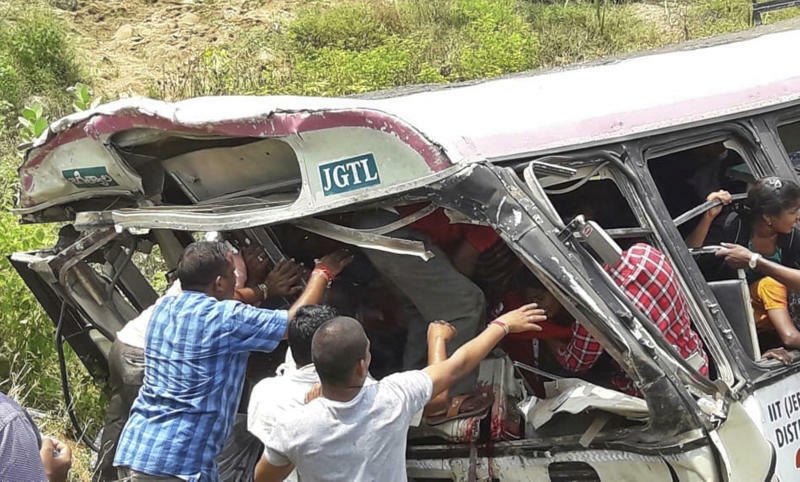 In July, 48 people were killed when a bus crashed into a gorge in Uttarakhand state.